Thousands of species of snake exist, coming in a range of sizes, types and colorings. 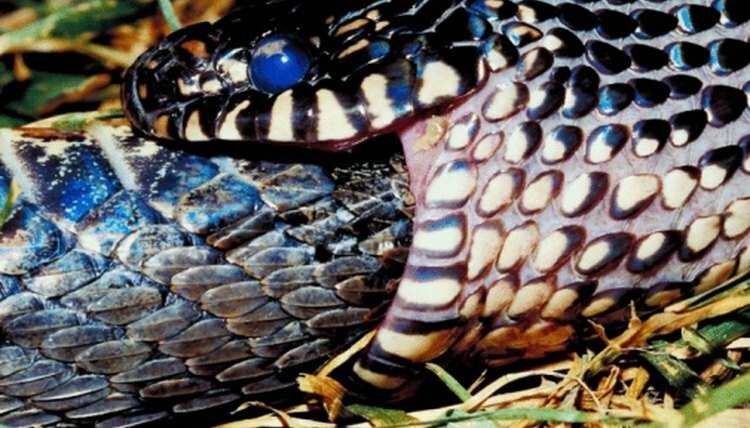 Being able to identify a species of snake can sometimes be vital in the event of being bitten. Several species of snake can be described as being yellow and black in color. Most are harmless, but some might be dangerous. The common king snake grows to between 3 and 6 feet (1 to 2m) in length and is mainly black with periodic yellow or whitish stripes around its body. The snake's home range is in the eastern U.S., from New Jersey down to West Virginia. Often found in forested or marshy areas near rivers, they prefer cover to hide in. The snake's diet includes small snakes, mammals, lizards, bird eggs and frogs. They are non-venomous and kill their prey using constriction. The yellow-bellied sea snake grows to just under 4 feet (1.2m) in length and is slender. They are black along the back and head with a bright yellow underside and a flattened-out tail end ideal for swimming. They are found in tropical or subtropical areas, preferring warm seas. They give birth to live young while in shallow waters. They are venomous snakes which bite and chew their prey to inject the venom. They feed mainly on small fish, swallowing them whole once they have be subdued. The yellow rat snake is a sub-species of rat snake found mainly in the northern U.S. All rat snakes have a hint of yellow, but are mainly black. The yellow rat snakes have strips of black and yellow running the length of their bodies, from head to tail. They grow between 3 and 6 feet (1 to 2m) in length and are constrictors. While preying mostly on small mammals such as mice, rats and squirrels, they also raid wild bird nests for eggs or chicks. The mangrove snake can grow up to 7 feet (2.1m) in length and is dark black in color, with thin, bright yellow strips at intervals around its body. They are native to Indonesia and are found in swamp and forest habitats. Mildly venomous, they are not a danger to humans, but can easily kill their small mammal prey. They also feed on small birds, reptiles and frogs. Like all venomous snakes, they have cat-like pupils; non-venomous snakes have rounded pupils.